Literally stumbling across New Moon Rising’s song “Child Of The Moon”, I was instantly rocked back by this gracious little neo-psychedelic track filled with wasted longing and inspired couch-bound intoxication. The track is filled with lovely harmonies that are sonically interwoven with meandering guitar work that ebbs lusciously forward, where they create a superb wake & bake number that will ride effortlessly in your back pocket, a song sounding fresh, yet inspired from the late 60’s & early 70’s, and at over nine minutes, will certainly give you every reason to drift. Their best music comes across with an ethereal presence of dream filled stories, little back porch numbers like “Troubled Times”, for when you’ve got nothing else to do but sit wasted in the sun and knowing that you’re gonna take your time doing it. What I smitten with most from New Moon Rising is their super smooth melodic countrified harmonies that are backed by light handed precise instrumentation that builds a single dream into a dreamy afternoon. Trust me, it’s just fine to watch the setting sun turn into an orange full moon. Then there’s their traveling numbers such as “Hit The Road”, and who doesn’t love a road song [? ], with this gem being no exception. 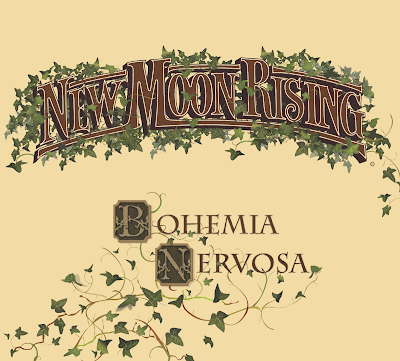 With their well crafted visions, New Moon Rising manages to let you feel the wind in your hair as you’re tapping your fingers on the steering wheel to a crackly beat dashboard speaker that’s delivering songs from unknown radio stations [from perhaps unknown times] as you cross the desert in the middle of the night, eyes wild in a world of stoner shadow-play an a velvet blue sky filled with stars. I’ve been down that trail before, and New Moon Rising has brought back those memories like a half forgotten kiss. In total, the band have four releases Surreal, Bohemia Nervosa, The Deep Unknown and their EP Pura Vida, all certainly good, with considered songs that course the alternative country genre, while mixing in a few surprises. It’s those surprises that grabbed my attention, nearly demanding that I create my own compilation of sorts, ten songs that will ride shotgun with me for a very long time … and since the music from all of their album’s is downloadable, you might just want to hear New Moon Rising the way I do, discovering “Hit the Road,” “Troubled Times,” “Mary Ann,” “Waste of Time,” “Free Tonight,” “Set My Soul Free,” “So It Goes,” “This City,” “These Hazy Days” and my personal fav “Child of the Moon.” That being said, I’m sure many are wondering why I rated this album in total as merely average … I assure you, my intentions were to rate the songs I’ve listed from across their collection, with these songs being no less than stellar in presentation and delivery, all songs that sound as if they have already stood the test of time. *** The Fun Facts: ‘Bohemia’ is a historical region and former kingdom of the present-day western Czech Republic. The Czechs, a Slavic people, settled in the area between the 5th and 6th centuries ad. A later principality was independent until the 15th century, when it passed to Hungary and then to the Habsburg dynasty of Austria. When Bohemia was incorporated into the newly formed state of Czechoslovakia in 1918, its capital, Prague, became the new nation’s capital. Though in this case ‘Bohemia’ or ‘Bohemian’, reflects a community of persons with artistic and literary tastes who adopt manners and mores conspicuously different from those expected or approved of by the majority of society. ‘Nervosa’: In Latin, ‘Nervosa’ means to be nervous … for contextual purposes it signifies the psychological addiction to a behavior, belief or habit that effects the body via the nervous system or the mind. When referenced to botany, ‘nervosa’ is used to describe a trunk or tree like pattern of veins within the leaves.